(Newser) – Gillian Genser is a Canadian sculptor who works only with natural materials, and in Toronto Life magazine, she recounts her own personal medical mystery. About 20 years ago, she began suffering debilitating symptoms such as constant headaches, frequent vomiting, aching muscles, and cramped hands. Specialists couldn't figure it out. Did she work with toxic materials, they'd ask? Nope, only natural ones, particularly crushed mussel shells for a large sculpture of the biblical figure Adam she'd been working on. "I spent up to 12 hours a day grinding and sanding the shells to fit into the shape of Adam’s body," she writes. The symptoms continued for 15 years, then worsened significantly in 2013. 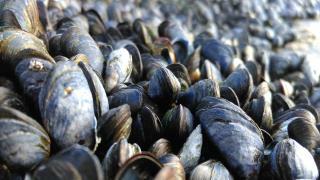 It was around that time that she visited a museum and learned mussels absorbed toxins in their environment. I have railed for years about advertising that states "all natural." There are all kinds of bad crap that is all natural.